If you think that I have moved to Chicago, think again. I have never been a fan of deep dish pizza, until now. Cleaning out the fridge Friday night, I found some leftover broccoli rabe, a few oven dried tomatoes and 3 frozen sausage links. Ok, let's make a pizza! I was inspired by Jen from Last Night's Dinner, who has made pizzas in a cast iron skillet with great success. I am not sure if this is really Chicago style, but we liked the change from our usual Neapolitan pizza. It was more like a stuffed pie. You use much less dough for this, you can probably get 2 pies from 1 ball of dough. 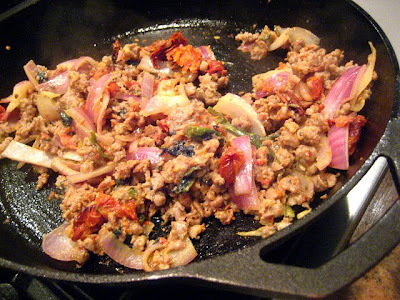 Crumble the sausage and cook w/ the red onion in a 12" cast iron skillet with a little oil. I used very lean sausage so there was very little fat leftover, so I added some olive oil to the skillet. When cooked, remove and set aside. You are going to use the same skillet to cook the pizza in. Spread your rolled out pizza dough and press into skillet (or have your pizza man do it, like I do!...that would be my husband). You will probably have to trim it off the sides. Spread a little olive oil over the dough. Layer tomato sauce, then the cooked sausage and onion mixture, then top with either fresh mozzarella slices or shredded cheese. I dabbed some pesto on top because there is no fresh basil in sight. Place the cast iron skillet in a 425F preheated oven and bake for about 20-25 minutes until crust and toppings are golden. When finished, you will be able to slide the pizza pie right out of the skillet. Slice as you would a regular pizza. This was a nice change. I could only eat one slice of this, it was very hearty, and it stayed hot for a good long time! I'm drooling over this one and it's breakfast time. I used to make deep dish pizzas all the time years ago but forgot all about them. Seeing yours makes me crave one now. It's really helpful to see these photos. 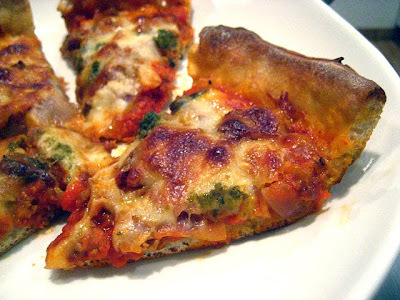 I've wanted to try deep dish pizza, but actually wasn't quite sure how to tackle it and how thick to press in the crust. That looks so tasty. I have to say I am not a fan of deep dish pizza either. I've been to Chicago for it quite a few times & really prefer the thin Neopolitan style we get here. I am from IL and we LOVE our deep dish pizza! Great job here! Mmmnnn! Next time I make pizza, I am trying a cast iron skillet. Well, duh. Why didn't I think of this? I make skillet yeast rolls...skillet cornbread. Deep dish pizza? Love it. 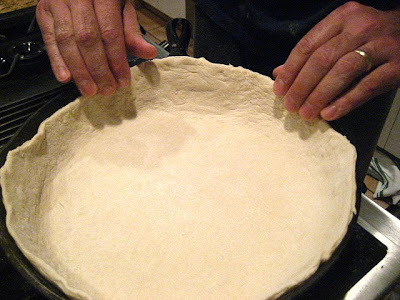 I was looking at King Arthur Flour's recipe for deep dish pizza, but I didn't want to fork out the dough (pun intended) to buy the special pan. Ha! You totally inspired me. 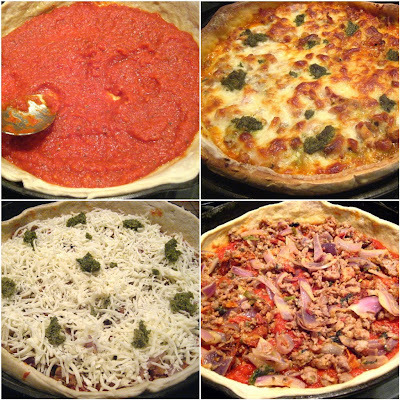 I've never been to Chicago, so I don't authentic deep dish pizza, but it sure sounds great. Thanks, you smart woman! Let there be cold beer with stacey snacks pizza the circle is now complete. Not bad for a Jersey girl! I have 3 different size deep dish pizza pans that I don't even use anymore for pizza, but I discovered my largest one is great for a deep dish apple pie for a crowd, you could feed an army! 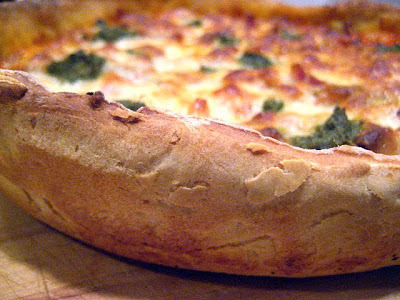 Oh, that looks really good, although we usually make thin crusts sometimes a deep dish sounds good. We make homemade pizzas every Tuesday night! I LOVE deep dish pizza and this looks beautiful! I sometimes make pizza in a cast iron skillet. It comes out perfect and is just the right size to share. Your toppings look fantastic! As someone who lived in Chicago, I've had my fair share of deep dish. 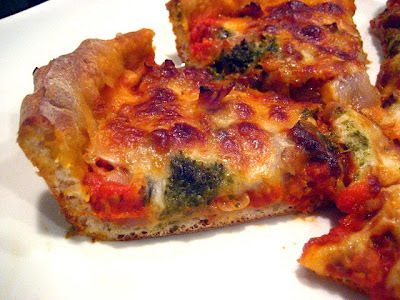 :) The biggest trick is to layer the dough with mozzarella before adding the sauce and toppings. Then top it all with more slices of cheese. It prevents the dough from getting soggy during the long baking time. Soooo yummy! I'm a thin crust pizza person myself, but I guarantee you I would not turn down a couple of these gorgeous slices of pizza. No sir. Great photos on how to do the crust Stacey. BTW, I made your lentil salad that you posted a while back and just put it on my blog. It turned out great. Check it out. Stacey - that looks awesome. I mean, really awesome. I'm midway between lunch and dinner right now and I could hit a slice of that way hard. I might nod off at my desk afterwards... but that's a risk i'm prepared to take.